Google is reportedly developing a virtual reality version of Android that will compete with software being built by Facebook, Samsung, Microsoft and others. Virtual reality is being eyed as the next big thing, and not just for gaming. Facebook has talked about how VR headsets will let friends communicate as if they’re together in the same room. A team of engineers at Google is building a version of Android for virtual reality applications, the Wall Street Journal reported Friday, citing two people familiar with the project. “Tens of engineers” and other staff are said to be working on the project. The OS would be freely distributed, the report said, mirroring the strategy that made Android the most popular OS for smartphones. The report didn’t provide any launch plans, and Google didn’t immediately respond to a request for comment. With rivals investing heavily in VR, it would make sense for Google to build its own OS. Facebook has referred to VR as the next big platform after mobile, and it bought headset maker Oculus VR last year for US$2 billion. They see VR as the future because it provides an immersive experience for gaming, entertainment, communications, and perhaps other applications not thought of yet. It’s still a way from mass adoption, though, and some people report getting nausea from VR systems, or just don’t want a big display strapped to their head. Still, there are lots of players in the space. Samsung has Gear VR, Sony has Project Morpheus, and Microsoft has HoloLens. Google, clearly, doesn’t want to be left behind. Virtual reality factored big in this week’s Game Developers Conference in San Francisco. Oculus has partnered with Samsung for the Gear VR headset, though the current model is incomplete and intended for early adopters. Oculus said during the show it plans to launch a fleshed out consumer version by the end of this year. Google has already signaled an interest in augmented reality, where images and other digital content is overlaid on the real world. It invested in Magic Leap, a startup developing a wearable system for augmented reality. Google also has Project Tango, which uses a smartphone camera to create a 3D map of people’s surroundings, so apps can better understand their physical environment. Leading the Android VR effort are veterans Clay Bavor and Jeremy Doig, the Wall Street Journal said. Bavor helped to create Google Cardboard, the company’s low-tech virtual reality viewer that attracted attention at last year’s Google I/O conference. Google Cardboard is essentially a piece of cardboard with some extra components that can turn an Android smartphone into a 3-D viewer. 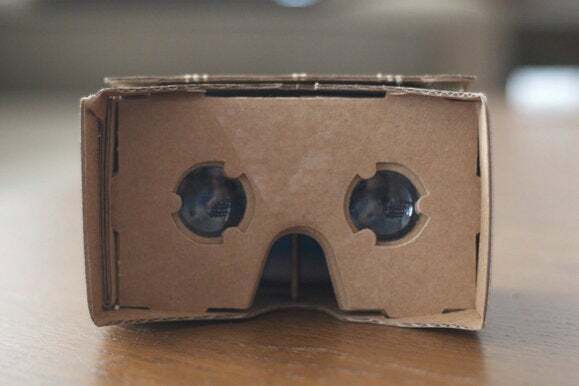 In developing Cardboard, Google may have learned lessons to apply to a full-fledged Android VR OS. And who knows, it may also have learned a little something about VR from Google Glass, the consumer version of which is now on hold.